The easiest way to make more money is to have an absolutely enormous amount of it already. Apple, which is sitting on a war chest of about $250 billion, is leaning into that fact with full force. With Apple Card, its very own credit card, Cupertino is becoming a financial services company. As we noted in the fall, Apple had a problem. The Tim Cook-led tech giant sat upon a mountain of cash it made from selling a boatload of iPhones. But the world is passing peak smartphone now that most people have a good one and each year's new slate of gadgets isn't particularly exciting. Discontented investors demand growth, which means even titanic Apple must find more ways to make money. That explains Apple's Monday, March 25 big event. On the stage previously reserved for new gadgets, Cook and company rolled out a number of paid services. Apple News+ offers access to select newspapers and magazines for a monthly fee, Apple Arcade offers a bundle of games, and Apple TV+ will be a streaming service featuring original programming. The most curious development, however, was Apple Card. Basically, it's a rewards card that lives on your iPhone and is deeply integrated with Apple Pay. The company will give you 3% cash back on purchases from Apple itself, 2% on anything you buy by swiping with Apple Pay, and 1% on any purchases with the fancy titanium physical credit card Apple offers with the account. These rewards come in the form of Apple "Daily Cash," which appears to be rewards money that's useable as cash anywhere that'll accept Apple Pay. The Apple Card-which is brought to you by the financial backing of Goldman Sachs and Mastercard, by the way-differs from standard cards in some other important ways. There is no credit card number, expiration date, or CVV. Instead, the account is tied to your iPhone/Apple ID and generates a unique number for every single transaction (unclear how this will integrate with online purchases where those are required fields and Apple Pay is not yet an option). The company claims it will do away with the confusing names on your credit card statement that make it difficult to ID purchases, replacing them with clear labels displaying the business where you spend your Apple money. Most notably, the company promises the absence of fees. No late fees if you miss your payment, no annual or international fees to use the card. Your APR will come in somewhere between 13.24 and 24.24 percent. 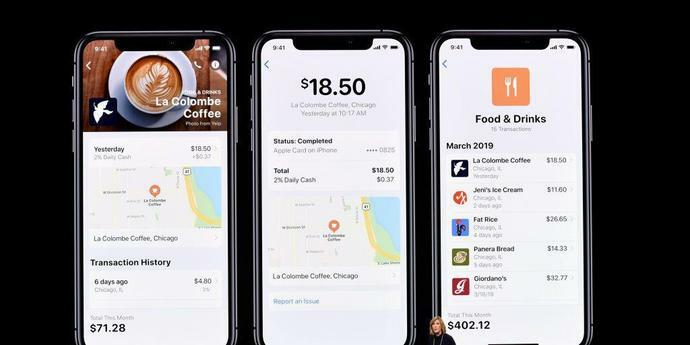 Apple promises that all the whiz-bang spending tracking tech will happen on your phone, and not it's services, for privacy's sake-meaning Apple won't know what you bought or where, said Jennifer Bailey, VP of Apple Pay. She also made a point of noting that, "Goldman Sachs will never sell your data to third parties for marketing and advertising." Of course, that statement conveniently omits the fact that Goldman Sachs could be using your data for its own purposes. I couldn't shake a deep sense of resignation during today's dog and pony show, in part because of bundles-all-the-way down future we seem to be facing. More fundamentally depressing, though, is this fact: Apple was a company that existed primarily to make stuff. Now it's becoming a company that exists to manufacture money out of the money it already has. That may sound stupidly obvious given the state of tech in 2019, but it's worth noting as a watershed moment. Steve Jobs pioneered the Apple big show platform to reveal computers, and then phones and tablets. Of the tech giants that now dominate the economy, Apple held out the longest as a company that drew its identity from physical technology, whereas Facebook made money by selling out your personal data, Google by selling ads, and Amazon by getting its fingers into every single thing imaginable. This is an oversimplification, yes, but Apple made the case clear as day that it thinks of itself as a services company now-or at least it wants its investors to think that way. And so the Apple Card charges into the financial world in which cheery, millennial-baiting websites and apps try to displace the gloomy, buttoned-up mortgage lenders and bankers of old with smile and that Silicon Valley sheen. Sure, you're sliding deeper into debt, but your Venmo spending comes with cool emoji and that app that just denied your mortgage has a neat UI. Apple's credit card effort floats upon not only its billions, but also its unmatched fanboy enthusiasm into the world of financial services. Will such goodwill carry far enough for people to accept their phone manufacturer as their credit card company? It might, and Apple would probably be silly not to try. But if the Apple big event is just an ad for monthly services, credit cards, and Oprah's Book Club, then maybe it's time to tune out. Why spend hundreds of dollars every year when you don't have to?